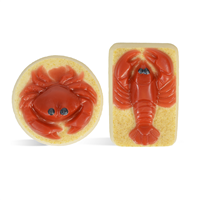 These cute soap crabs and lobsters are packed full of roughness for a gentle exfoliating soap. The oatmeal soap is complemented with luffa powder for extra cleansing power. Fishermen will love these bars to scrub away the smell of crabs and fish from their hands and tourist will love the cute design to bring back from their ocean vacation. To plastic beaker, add black color and melt in microwave. Use a plastic dropper to drop color into each crab & lobster eyes. To small measuring cup, add extra clear soap and melt in microwave until melted. To plastic beaker, add glycerin and red powder and mix well with mini mixer. Add to melted soap and mix well. Move some of red soap to plastic beaker. Spray the eyes with rubbing alcohol, and when the melted soap is 130ºF or cooler pour red soap into lobster and crab details. 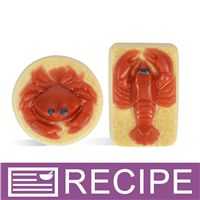 As red soap hardens, spray with rubbing alcohol and continue to pour more red soap until the crab and lobsters are filled. Allow red soap to harden. To measuring cup, add oatmeal soap and heat until melted. Add fragrance and luffa powder and mix well. Allow soap to cool to 130ºF. Spray red soap with rubbing alcohol and fill each mold cavity with oatmeal soap. Allow soap to harden and remove bars from molds. Place soaps into shrink wrap bags and fold back bags and secure with tape. With a hair dryer, shrink the plastic. Add crinkle paper to cello bags and place soaps into each bag. Tie bags closed with raffia. "Could basic goat milk soap bu substituted for the oatmeal? Thanks"
Staff Answer Yes, you can choose another soap base for the over pour. It will just not give you that sandy, beach look as the oatmeal soap does.